October 12th sees the release of Jane and Emma, shedding light on the unlikely friendship between black convert, Jane Manning James, and Emma Smith, wife of LDS church founder, Joseph Smith. 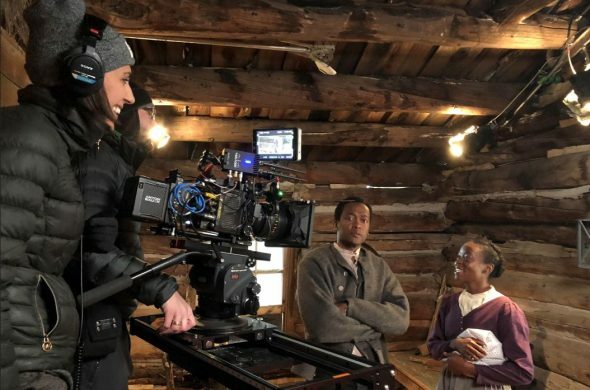 Filmed in Utah, mostly at This Is The Place Heritage Park, there is a strong female presence both in front of and behind the camera, with complex characters prompting new conversations. We caught up with Utah’s own Chantelle Squires, director, producer and editor, to talk all things film. 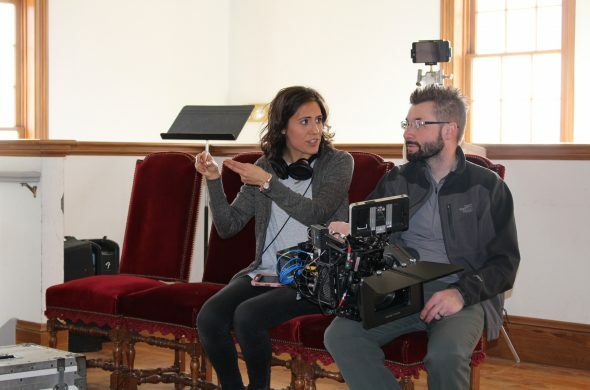 Chantelle has 15 years’ experience in the industry, having directed and produced PBS documentary, Reserved To Fight, and co-founded production company, Mirrorlake Films, producers of the Emmy award-winning third season of The Generations Project for BYUtv. Chantelle is a graduate of the film program at Brigham Young University and has two children who are “the absolute light of [her] life”. Jane and Emma is in theaters October 12th and you can watch the film’s trailer here. I have always been very interested in telling stories that give a voice to the voiceless. I also know that when I start working on a project like that, I will end up dedicating a huge portion of my life to it, so it needs to be worthwhile and have meaning for me. This story is incredibly personal because I feel very strongly that women’s voices need to be heard and our stories need to be told. There are a lot of different points of inspiration that went into making this film, but one of the things that really spoke to me is the fact that we get to address real issues through the voices of real women. Jane struggled with racism; Emma struggled with polygamy. To get a chance to discover what that was like and how these incredibly strong women handled it, first in the writing process, then in production with my actors, and then eventually again in the edit, was a dream come true. Why do you think the story is relevant today? While this film is set in 1844, human nature is still very much the same, unfortunately. It is easy to get so wrapped up in our own lives that we block out the injustices that so many people have to deal with every single day – especially within a religion. There are a lot of things that happened in Jane’s life and her journey with the Church of Jesus Christ of Latter-day Saints. She remained a faithful member her whole life, but was not given the same blessings and opportunities as other members simply because of the color of her skin. Even though that policy has changed, the pain of those actions has not just magically gone away. While the issues of race and injustices, and religion and injustices cannot be solved in one film, we can certainly keep the dialogue moving. There are two reasons why we filmed in Utah. First, we couldn’t have found a better location. This Is The Place Heritage Park has preserved the past in their collection of buildings. Some of the buildings we filmed in are over 150 years old. It is remarkable. Our production designer, Brian Lives, had such a rich palette to work with that by the time he was done, it felt like we had a million-dollar set (which we did not!) We filmed all of our interiors and some of our exteriors on this lot, and only had to spend one day on location in Nauvoo. This was a low budget film, and there is no way we could have had that level of production value anywhere else. The second reason for filming in Utah was our crew. I am still amazed when I think back to what we accomplished with the time and resource limitations. Everyone working on this film was invested. They cared about their work and they cared about this story. They are also incredibly talented and experienced, and I couldn’t have asked for a better crew. Can you tell us about your experience working in Utah? How much of a Utah presence did you feel on set? I will always try and make my films in Utah if I can. I don’t know that I would have been able to make this film happen anywhere else. The resources we had here, from the tax incentive, to the locations and the crew, were vital in making it come together. The majority of our crew was Utah based, and outside of our lead actors, the cast was also from Utah. I am also a single mom, and I live 10 minutes away from our set. It was truly a gift for me to be able to go home and hang out with my children on many of the nights during production. I know that living in Utah is the only way that this career has been sustainable for me. It’s a really wonderful place to make films. The film had a strong female presence both in front of and behind the camera (inc. writer, director, producers). Did you consciously seek out women to work on the film? I cannot imagine working on this film without all the women that were a part of it. Even though I actually really enjoy working with men, I often find myself as the only woman at the table. That never feels right, and I most certainly do not speak for all women, so when I get a chance to have control over who is sitting at the table, there will always be a balanced number of men and women. On this project, we had a female writer, Melissa Leilani Larson, and an entire team of female producers. I remember that one of the first things my producer, Madeline Jorgensen, did was hire our UPM, Jennifer Ricci, who then sought out our first AD, Diane Mayne. It trickled down from there and realized that we had almost exactly a 50/50 split of men and women on the set. I think women are able see each other a little better, so we are quicker to hire each other. Not to mention that we are more inclined to write better roles for each other as well, which is how we were able to land the incredible actresses that we did. But I was also very conscious about all the talented men that I hired to work on this film. We all worked very well together. I always had a video camera with me in high school. I loved figuring out how to make videos back in the “olden days” when all I had was a VHS player and High 8 camera. My senior year in college, I was getting my makeup done for a photo shoot and I was so fascinated with how much the makeup artist loved her job. I asked her how she knew that she wanted to have a career as a makeup artist. She told me to “figure out what you love doing the most, and then figure out how to make money doing it.” I knew exactly what that was, and enrolled for an intro to film class. On the first day of college as I was sitting in the class, I knew deep down in my soul it was where I was meant to be. I started out as an editor, which was actually probably one of the smartest things I could do. I learned so much about storytelling as an editor working on features and short films, and eventually started directing my own projects because I wanted to have more control over the films I was editing. I directed my first feature documentary that got picked up by PBS, and my career took off from there. There are opportunities to be had and there are opportunities to be made. In Utah, it is possible to make those opportunities. Reach out to the Film Commission. Meet other local filmmakers. Be helpful to other filmmakers. We all have to be a team. Work hard. Tell GOOD stories. The story is so important. There are a lot of talented people in the state of Utah who are willing to get behind a good story, especially when the project is fueled by passion. The resources are at your fingertips here, so get out there and make it happen! Chantelle Squires directing on the set of Jane and Emma.